A Farmland RV Fly-By at 55 mph - Highlights of the Northeast! A Farmland RV Fly-By at 55 mph – Highlights of the Northeast! 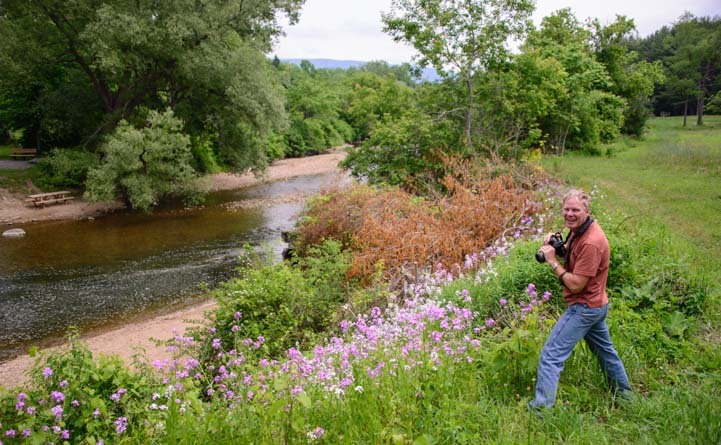 June 2015 — After saying goodbye to the long tree shrouded road that winds from the Smokies along the Blue RIdge Parkway and into Shenandoah National Park, we pointed our RV to the northeast and began a wild ride. Our goal was to get from Virginia to Maine without getting too tangled up in Philadelphia, Pittsburgh, New York City, Albany or Boston, and we chose a route along secondary highways that threaded its way between them all. We zig-zagged through small towns in the countryside in Pennsylvania. 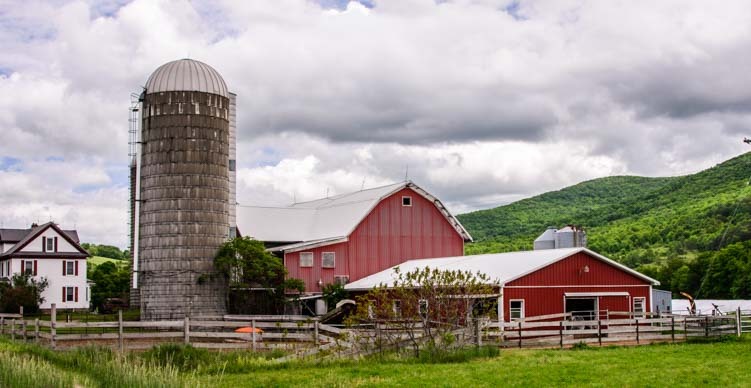 This is big time dairy farming country, and barns, farmhouses and silos of every shape and configuration dotted the landscape. Red ones, green ones, white ones. Classic! Not too many farmers paint their barn green! Our dance down the highway was punctuated by occasional scenic surprises that got me leaping out of my seat to try to catch them with my camera. Out of the blue, we came across a fabulous arched bridge. 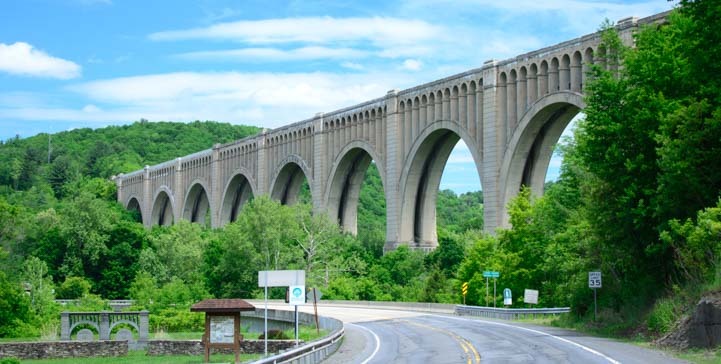 This turned out to be the Tunkhannock Viaduct in Nicholson, Pennsylvania. 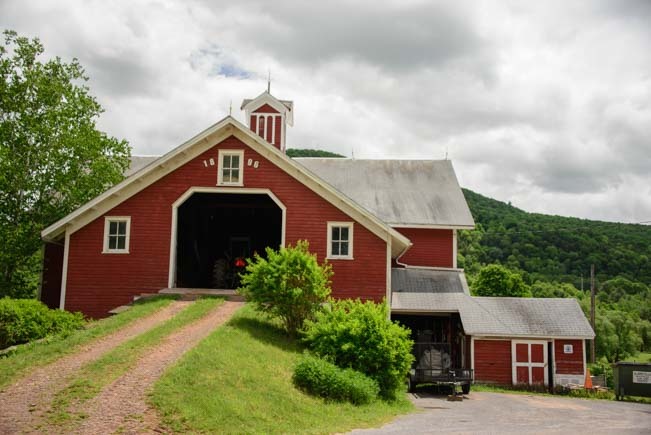 We crossed into New York and eventually ended up on Scenic Routes 10 and 23 that follow the farm filled valleys in the Catskill Mountains. The views along the scenic drives through the Catskills were lovely. We were flying along, pushed by heavy truck traffic but hanging out the windows anyways to take in the views and enjoy the scenery. Suddenly we passed a covered bridge — and we just HAD to do a U-turn to go back and see it up close. What a beautiful place to stretch our legs and breath deeply for a moment. 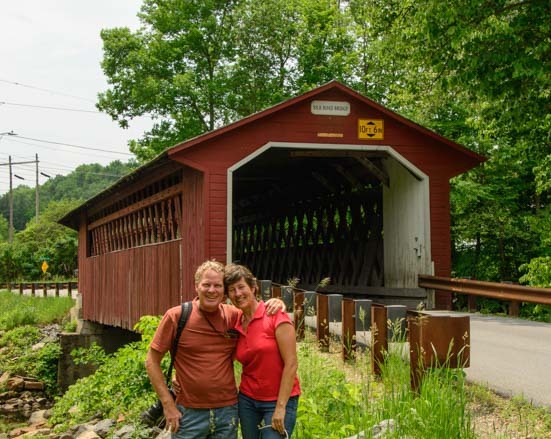 This was the Hamden covered bridge, and we learned later that old wooden bridges were covered not so much to protect the people crossing the bridge, as I had thought, but to protect the bridge itself from the elements. We walked through the bridge to beautiful views beyond. This little piece of antiquity was built in 1859. We walked through and watched the view open up on the other side to a beautiful farmhouse set amid rich green fields. 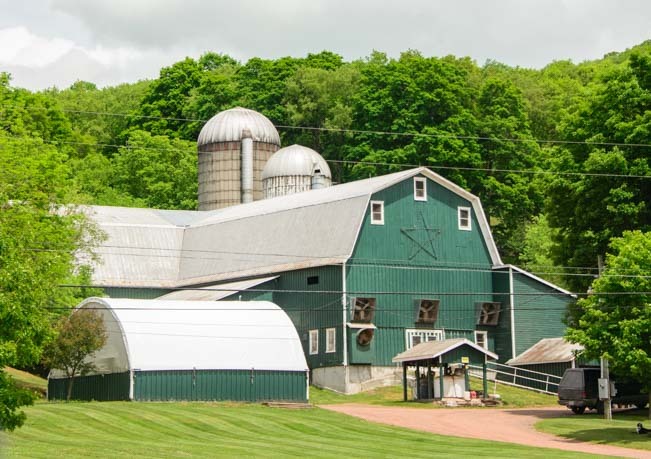 A lovely farm just beyond the covered bridge. Hard to believe that New York City is just 142 miles away!! Carrying on, we hopped back in the rig and continued east and north though the Catskills. These scenic roads are worthy of a leisurely drive, but we hustled down the highway intent on our goal of reaching Maine. Someday we’ll go back and spend some time really enjoying the beauty of this countryside at a slow pace. One surprise was that there were lots of scenic rest areas to stop for a quickie overnight. Finding places for quickie overnights was easy. Lack of Verizon service so close to Manhattan was a big surprise! Equally surprising was that we had no Verizon service for many miles and very iffy service for many more. 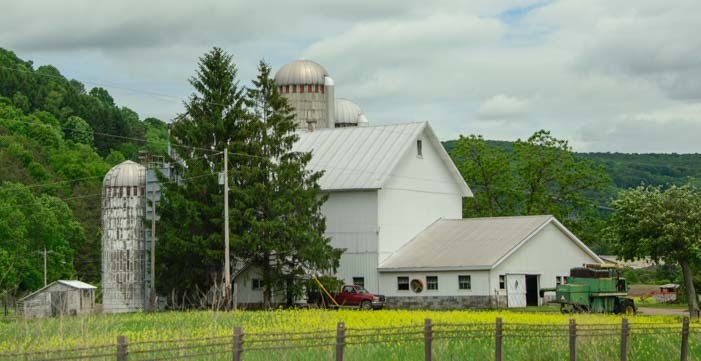 It is hard to believe that this truly rural area is less than 150 miles from downtown New York City. I caught a handful of the fantastic farms with my camera out the window, but there were dozens of others that were far more beautiful that slipped by before I could capture them! Farming in Grand Style in New York! The pretty rural scenery made up for the craziness of driving these roads. Our breakneck pace slowed for just a moment when we crossed over the border from New York into southwestern Massachusetts. 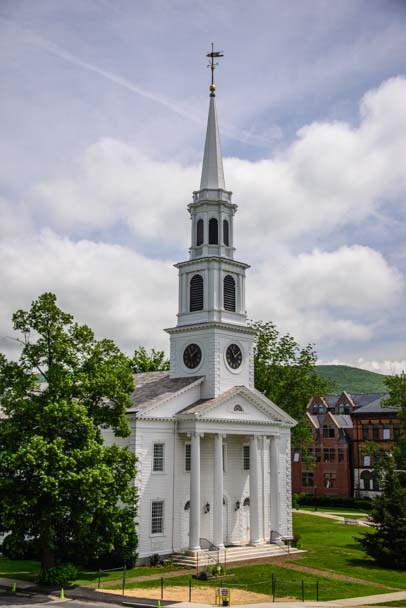 A quick bike ride one morning through the village of Williamstown brought us to beautiful a white church that seemed to come right out of a New England picture book. 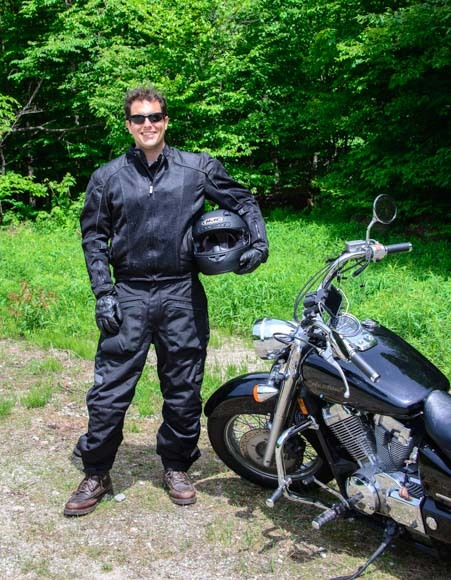 We paused again for a breather in Bennington, Vermont, where we met Nicholas, a motorcycle traveler who was on Day 1 of a six week trek across country from Maine to California. We watched in amazement as he strung up a hammock in the trees for the night. The next morning it was only 39 degrees out, but after a hot cup of coffee in our rig while sitting next to our toasty warm heater, he was fired up for Day 2 of his journey which would take him all the way to Philadelphia in a straight shot. 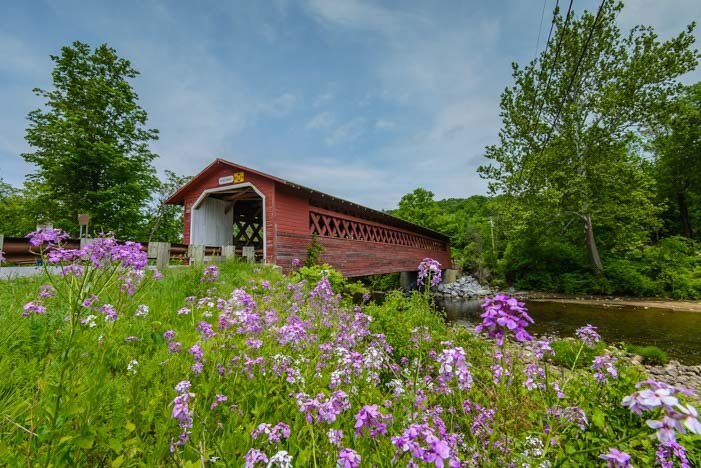 Before moving on ourselves, we were delighted to find out that Bennington, Vermont, boasts three covered bridges, and one of them was sitting in a beautiful bed of wildflowers. As we were enjoying taking pics of this bridge we heard the rumbling of a huge vehicle coming down the road on the other side of the river. Suddenly, this big old truck poked its nose through the covered bridge! 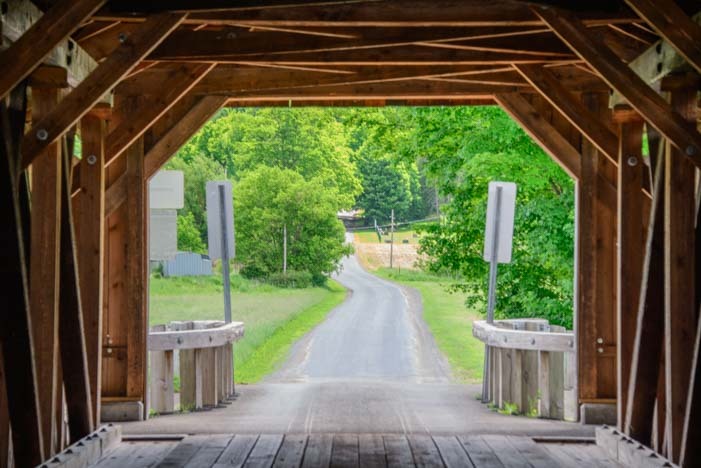 We had been quite startled by the amount of truck traffic on the small country roads in the northeast, but seeing this enormous truck squeeze through a covered bridge totally floored us. Ironically, a few minutes later an 18 wheeler pulled up to the bridge and stopped right in front of it with its flashers on. He sat there for a long time. Finally, he did a tight turn onto another road — he never would have fit! We laughed that the truckers seemed to find these roads challenging too and that once in a while they even ended up in a tight fix just like we did!! 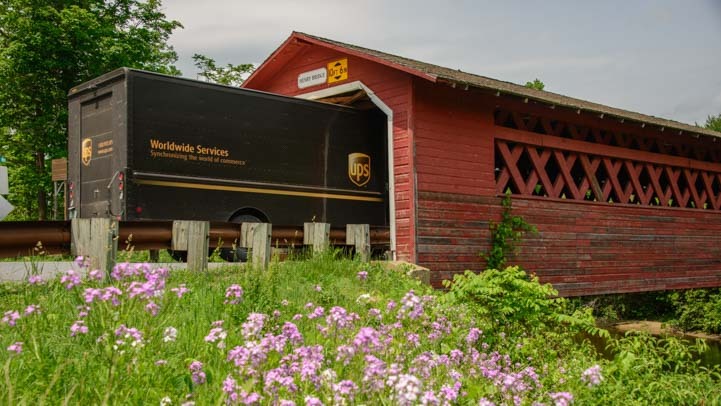 Moments later a UPS truck showed up, and he didn’t bat an eye as he barreled right through the covered bridge at full speed. 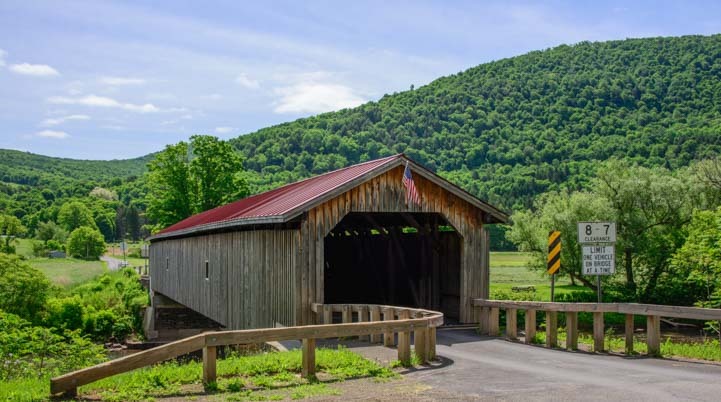 Obviously, for him, going through this covered bridge was a regular part of his route! Geez, there goes another big truck. Trucks are used to tight squeezes around here!! After a quick selfie and a chat with a pair of Spanish travelers from Mallorca who were photographing the bridge too, we packed up the rig and left Bennington. We soared up and over Vermont’s Green Mounains and then turned east to climb over the White Mountains of New Hampshire. In no time we had made it to Maine. but we were already finding lots of charm. So far our travels in the northeast had been just a fly by, but once we hit the beautiful Atlantic coast of northern Maine we would slow way down. As their license plate says, Maine is “Vacationland,” and so it proved to be for us too. 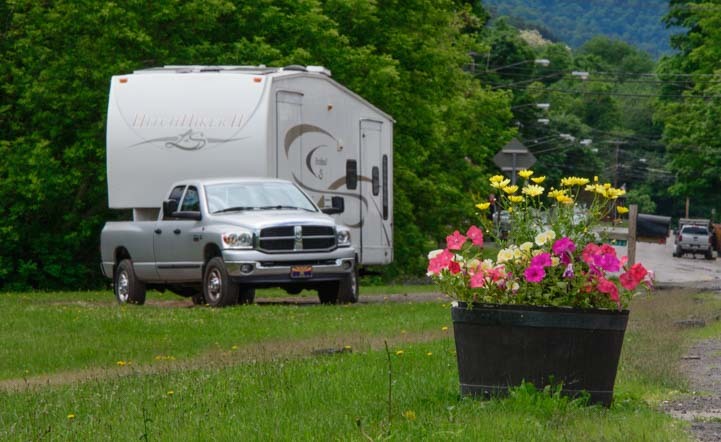 Driving an RV in the Eastern States – A Wild Ride! – The Driver’s View of this same trip! This entry was posted in New York and tagged New, New York, Travel, USA, WP Travel by Roads Less Traveled. Bookmark the permalink. We aren’t in Maine any more, Amanda, only in Blogger Time!! We’re in Nova Scotia now. Are you coming up this way?? The backroads of the northeast and in particular New England are lovely. “You can’t get there from here” is often used when going from point A to point B is not a straight line but a very circuitous route. Even the interstates have that problem at times. That’s why you will find tractor trailer trucks on local roads and highways. I am particularly fond of I-89 and I-91 in Vermont, my home state. I never tire of the views from these highways, which don’t have a lot of truck traffic like interstates south of here. I- 93 goes through the White Mountains in New Hampshire is also lovely. Just stay away from I-95 and the Boston area. Rush hour through Hartford and other small cities, big for here, are not particularly difficult. Albany, NY included. The Northway I-87, in NY, is a lovely highway as well as I – 88 in New York. Again not too many trucks and lovely vistas. Of course the local routes are charming – in Vermont Rt 7, Rt 5/10 and Rt 100 right up the middle of Vermont. Route 9 in southern Vt, Rt 4 in central Vt and RT 2, which starts in Maine, comes across northern NH, and into Vt and ends up in the Champlain Islands. Rt 2 in Mass from Greenfield to Albany another great road. In New Hampshire do a circle route of the White Mountains which includes 16, 302, I-93 and Rt 2. The state roads of western Mass and Connecticut are lovely too. Make sure you explore various fingers of Maine by getting off Route 1. There are the Adirondacks, Finger Lakes, and the Thousand Islands area of NY are all wonderful. Ahhh… the voice of experience. Thank you for all the tips. I’ve enjoyed driving most of those roads in the past, and we had a chance to do a few of them on this trip too. New England is very beautiful! Question…..we have just started our adventure of full timing as of three weeks ago. We have been volunteering for various states as camp host and now are officially homeless. We are planning on going back to Yuma area for the winter and then heading East and ending up in Maine next fall. We have plans on doing the Blue Ridge Parkway and I was wondering what your opinion overall was of it. I know you said that there were many pullouts that you couldn’t see the views. Kind of like that old saying, “Can’t see the forest because of the trees”. Would you recommend going that way or taking a different route? The magic of the Blue Ridge Parkway is partly the parkway, but for us was largely the things to see and do nearby. We really enjoyed using it as a guideline for our travels north through NC and VA.
Thanks…. We really enjoy your blog. I have been following your travels and really enjoy your post and pictures. I was hoping y’all would make it to Nova Scotia which you did. I had a heart transplant 2-2-12 (3 yrs 5 mos) ago. We bought us a 37′ Fifth Wheel and have been traveling a making memories. Our next “big trip”, will be to the home of our Cajun ancestors, Acadia/Nova Scotia, using a similar route you all used and are on. Looking forward to more post and pictures and tips on things/places to see. One question for you and the locals is, what is the is the best time of year to make the trip and be up in that area? 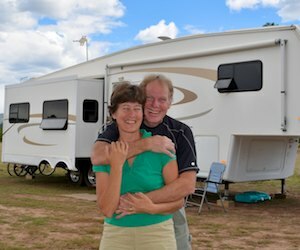 Another would be, if we decided to take a Fall trip, when does it get too cold to enjoy RVing in the Nova Scotia area? Safe Travels! Congrats on jumping into a fiver and hitting the road after such a huge operation!! I’m so glad you have been inspired by our travels. Thanks for reading!! We have found Nova Scotia to be in the 50’s and 60’s during the last week of June. I imagine September would be similar and October would be cooler.